Billy is an Account Manager for Populus Group and sits onsite at one of our clients. He is responsible for making sure that we keep our commitments made to them from the inception of the program. He also plays in integral part in developing and maintaining the relationship with some of the key stakeholders on the account. 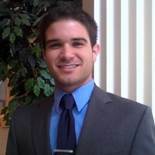 He previously spent 3 years in our Troy, MI headquarters before relocating to San Jose, CA in August 2014 to support the clients that he works with currently. He will be going on his 2nd trip to Europe in June 2016 and is still a huge Detroit sports fan!